The Biaggini Research Program in the Department of Biological Sciences at St. Mary’s University was established through an endowment created in honor of Benjamin F. Biaggini – Distinguished Alumnus of St. Mary’s University and former CEO of Southern Pacific. The overall goal of the program is to enhance the ability of faculty members in our department to engage in research projects as a means for professional development in the form of publication(s) and/or additional external funding to continue their research endeavors. 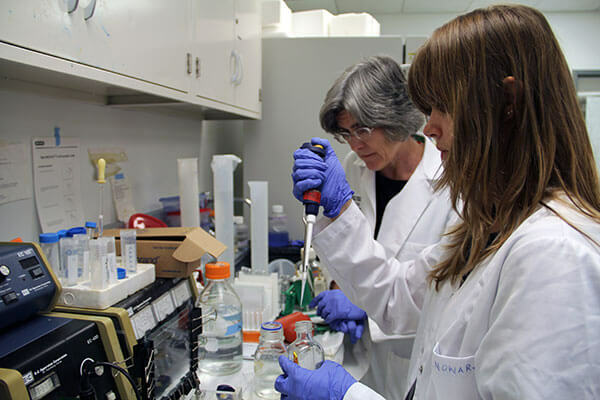 The funds from this endowment were utilized to establish the Biaggini Endowed Chair in Biological Sciences and to create a research program that provides funding for at least two faculty members (Biaggini Research Fellows) in the department that are actively involved a research project associated with some aspect of human health and/or disease. The Research Fellow budget includes released time to engage in the research, funds for purchasing supplies, and funds for travel to present findings from their research projects. Additionally, funds are utilized to provide scholarships to junior or senior level biology majors who are named Biaggini Research Scholars. As part of the requirements for receiving these scholarships, the Biaggini Scholars are required to actively participate in an ongoing research project of one of the Biaggini Research Fellows or another faculty in the department. Travel funds are also provided for these students to attend a national meeting or conference to present their research findings.